"A deposition is the out-of-court oral testimony of a witness for later use in court or for discovery. Some states refer to the deposition as an "examination before trial" (EBT), though depositions may actually be taken during a trial." But that Testimony Cannot Convey the Demeanor of the Deponent! A videotaped deposition communicates demeanor, facial expressions and vocal inflections clearly to a jury, eliminating the confusion a written transcription alone may cause. We use professional equipment and perform our duties at or above the strictest standards established by the Federal Rules for Civil Procedure (Rule 30); State Court if applicable; and the National Court Reporters Association. 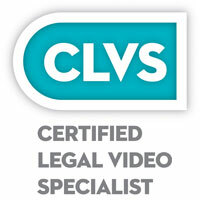 Huntridge deposition videographers are Certified Legal Video Specialists. We work with the Court Reportes to assure a reliable and accurate record. Mat Hunt helped to draft South Carolina's legal deposition procedures. (Most of which were "rubberstamped" into many subsequent state & the prevailing Federal rules mentioned above). Don Cely is a board member of the national NCRA/CLVS council. Huntridge videographers use high-quality digital formats to record depositions, even HiDef if requested. Delivery of the final product can be made in any format. Most clients order a DVD that is playable fullscreen on a computer or conventional "set-top" player. A valuable option is the SYNC, in which the video deposition and transcript are combined to provide a convenient, searchable record. Sync DVDs can be used with popular trial presentation software such as Sanction, TrialDirector and even PowerPoint. We produce our Syncs in-house for the best quality and reliability. To Schedule a Video Deposition, call Don Cely at 864/901-0807, then email your Notice to us at depo@huntridge.com. Once we receive your Notice, we will confirm in writing via phone or email.